When Mike Namer was 10 years old, he and his brother came to the U.S. as refugees from Cuba to live with a foster family in Whittier, Calif. 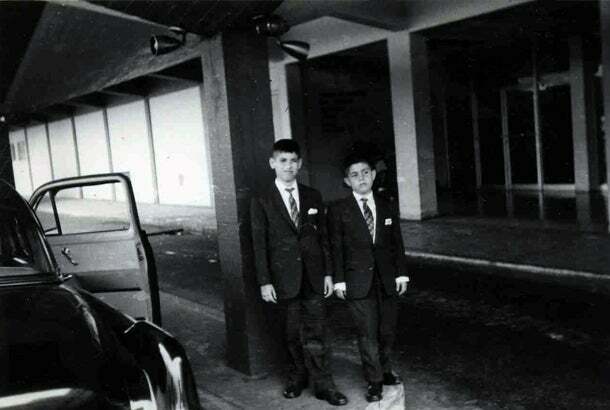 It was 1961 and the boys had never been to the U.S., but now, without their parents by their side, they were suddenly calling the place home. While he might have sent his kids to the U.S. alone 55 years ago, ask Namer today what he's most grateful to his dad for and he'll tell you without hesitation: "He taught us that family is the most important thing." Nearly a year after sending their kids to live in the States, Namer's father and mother arrived themselves and the family was reunited. Soon, his dad found work at a factory sweeping floors. A year later, he was cutting and making shirts. A year after that, he got involved in fashion design. And a year after that, he was starting his own company with the foster father who'd taken his boys in when they first came to the U.S.
"He has a real sense of business," says Namer of his now 90-year-old dad. And he should know. For the first 20 years of his career after graduating from college, he worked side-by-side with his father, who by that time had started and grown an international trading company that sent both him and his sons around the world for business. Namer and his dad moved from one venture to the next together, later deciding to focus their business efforts on New York City, buying up property and putting up buildings. Today Namer is founder and principal of the Manhattan building company, Alfa Development and owner of HGU NYC, which stands just steps from the Empire State Building. And much as his dad did, he's kept business in the family, with his eldest son, now 30, working as an executive vice president at the company. "I guess it's in the DNA," says Namer. Nonetheless, keeping family together has always been a priority for Namer, much as it was for his dad. "When we left Cuba, we lost everything," he says. "He kept us together and had a sensibility of family and work ethic. That's always shaped my point of view." "I always tell people: 'The best thing you can do for your kids is to hug them and give them unconditional love and they will turn out good.'"